From: $65 Monthly Plan: After 22GB/line/mo., you may experience slower speeds than other AT&T customers during network congestion. Data speed limited to a max of 3Mbps. For content we can identify as video, speed will be limited to a max of 1.5Mbps at Standard Definition quality(about 480p). See att.com/broadbandinfo for details on AT&T network management policies. Mobile hotspot used is prohibited. To: $65 Monthly Plan: For all data usage, you may temporarily experience reduced speeds during times of network congestion. For content we can identify as video, speed will be limited to a max of 1.5Mbps at Standard Definition quality(about 480p). See att.com/broadbandinfo for details on AT&T network management policies. Mobile hotspot used is prohibited. When the network is not congested their data will no longer be throttled to 3 Mbps. Speeds as high as 100 Mbps are possible on AT&T's network, although 20 Mbps or less is typical. When the network is congested, $65 plan users will see lower data speeds and increased data latency compared with users on other plans. In other words, $65 plan users connected to an AT&T tower in a rural area with few other customers you will likely see much faster data. On the other hand, data will be slower and more unusable than ever for $65 plan customers in places where the network is congested, such as major sports events, music festivals and lunch time in big cities' business districts. If you don't like the $65 plan's full time de-prioritization, ATT has an $85/month ($75 with autopay) unlimited data plan that's only subject to de-prioritization after you have used 22 GB of data in the current month. 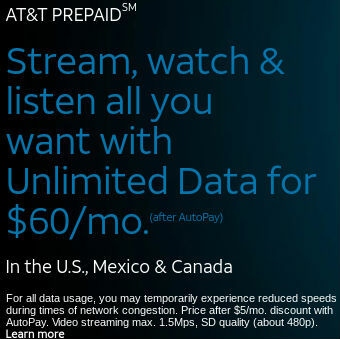 If you don't need unlimited high speed data, AT&T Prepaid's $35 1 GB and $45 6 GB aren't subject to de-prioritization, although they are throttled to 128 kbps after 1 and 6 GB respectively. See our Prepaid Operator Profile: AT&T Prepaid for details of all AT&T Prepaid plans. Making cheaper unlimited data plans subject to de-prioritization at all times seems to be AT&T (and Verizon's) new weapon of choice for netwrk management. Verizon's $75/month prepaid plan is subject to de-prioritization at all times. Verizon and AT&T both offer two different postpaid unlimited data plans, a cheaper one that's subject to de-prioritization at all times if the network is congested and a more expensive plan that's de-prioritized only if the network is congested and the customer has used more than 22 GB in the current month. If you are on one of these new, always subject to de-prioritization plans, how is it working for you? Please share your experiences in the comments section below. Source AT&T via reader tip. I am glad they did this. PLEASE DO THIS FOR CRICKET'S UNLTD 2!!! I hope to see a similar change with Cricket, as I live in a city that is not generally congested, and I think that I'd be okay with deprioritization during network congestion over consistent throttling. With that said, I am interested to hear about how these new data management changes are impacting user experience. For everyone who has not been paying attention, de-prioritization is a newer, better alternative than hard caps or shutting off service to users who "abuse" their unlimited service. I suppose there are probably some people who would rather have those alternatives, but I would never call them "idiots." "Abuse" is the entirely wrong word for this. Corrected. "For everyone who has not been paying attention, de-prioritization is a newer, better alternative than hard caps or shutting off service to users who use what they paid for. The far better "alternative" would be for carriers to honor their advertising. Unlimited means unlimited. The only "idiots" are those who argue in favor of any of the scams... this one of "advertise unlimited but choke it off and don't deliver" is one, for sure. Please CRICKET WIRELESS DO THE SAME!!!!!!!!!!!! So hotspot use is prohibited. But not Screen Mirroring your phone to the smart tv, which uses wifi-direct. No need for a router. Screen Beam Mini 2 from Actiontec adds Screen Mirroring to the tv through hdmi. Sony BDP-S3700 Blue-ray player does screen mirroring. Galaxy J7 or better offers screen mirroring through the Smart View app. This is how I'm getting around it. Actually mirroring to my Windows PC, as I do not have a smart TV. So it's 1.5mbps or less for the stuff that actually requires a fair amount of bandwidth. That's like giving a guy a steak except when he's hungry. It's great for dainty little stick figures on a mobile diet, or gluttons who gorge themselves on readily available wifi. But if you're a run of the mill mobile media consumer, Cricket's still a trash tier carrier. Netflix, Slingtv and Vudu allow the playback resolution to be set at 480p for every show. That is what I do, the picture is good and never buffer and save data. HD is overrated. I bet the same person arguing for 4K video viewing on phones is the same one who argues that 3" is the best screen size and anything over 4" is a monster phablet. Isn't this change for the worse? It's true that you can get faster speeds, but could anytime deprioritization mean unusable speeds, much like the ones reported by Verizon Prepaid users? This is my thoughts exactly. I hardly use any data but when I want to use Google Maps or check sports scores, and can't because of deprioritization, it makes the phone unusuable. I left Tracfone on Verizon because of this reason. Went to Tracfone sim on AT&T but may now look at Sprint or T-Mo. Say no to deprioritization!! If they all go to this business model, I'll end up using VOIP only or back to a flip phone. What speed could the system handle if everyone is on it at the same time? Seemingly its not 3 mbps. Additionally, if they deprioritize, then to what speed will they lower you to? 1 mbps? or 128 kbps? Additionally, the idea here is that you can get deprioritized even before your 22 GB usage? The overall point is that it's not worth paying for big data nowadays unless you're in a smaller population area. You'll never hit even 10GB at 1mbps or lower, but you'll presumably be using your phone when everyone else is, which pretty much guarantees that congestion will cripple most consumers' data speeds on these horribly overbooked networks. The only ones who'll ever actually see peak speeds are homeless bums wandering around at 3am when everyone else is sleeping. Even then, a legion of late night ridesharing drivers could still drag things down because these networks just aren't designed with adequate capacity relative to today's data intensive, constantly connected world. The sad fact is, profound under-investment has allowed mobile data speeds to regress straight back to 3G, and things will never get better unless the market transitions from capped data to set bandwidth a la wired internet. The era of data allotments mattering is over. Bandwidth at peak times in congested areas is the new differentiator now that everyone and their grandmother is streaming 4k over LTE. And yet, the kicker is that all these carriers are moving in a less competitive direction, only further devaluing their services to the point where they're almost but not quite obsolete. I'm on the old 65 plan how do I change to the new one. There's no option to do it online. Not sure where to put this, but according to my prepaid account's online account management they've quietly added another plan: $50/mo. unlimited talk/text/8 GB High speed data, then 128k. $40/mo. with autopay (making this the same autopay price as the 6 GB plan). No mention on their prepaid plan page or press releases yet. So my unlocked note 4 from Verizon works great on att prepaid. I have the $65 plan which for me is $55 because I use auto pay. Also hotspot works for me and my speeds never slow down. Most likely because I'm using an unlocked phone. Bring an unlocked smart phone to att prepaid and experience a great network and free unlimited data and hotspot. Just a side note....if you're on the old $65 plan at 3mbps, you can remain on that plan (since it's grandfathered)....HOWEVER, once you leave that plan, you cannot get it back.